Liao Lichun, born in 1965, is a volunteer devoted to planting trees in China's deserts. Liao is one of the star pupils of Liu Chuanzhi, legendary founder and former chairman of China's PC giant Lenovo. He became manager of Lenovo's Guangzhou branch in 1989 when he was 24, and started his own business four years later. 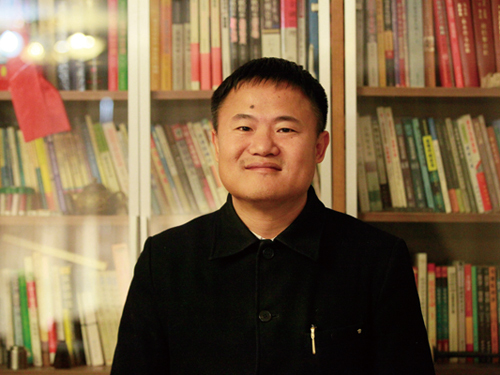 When he was 39, the annual revenues of his businesses surpassed hundreds of millions of yuan. However, the man resigned from his post as company president in 2004 and began to travel across China to help in poverty alleviation and education projects. In 2010, Liao founded a volunteer organization to make deserts green again, and starting in 2011, he became a full-time volunteer in the deserts of Inner Mongolia and Hebei. So far, he and his team members have planted more than one million trees in the Otindag Sandy Land in central Inner Mongolia, which is the nearest desert to Beijing, and one of the major sources of sandstorms affecting Beijing and Tianjin. By the end of 2014, Liao had invested more than 10 million yuan in making deserts green. Liao, who is skilled in planting and nurturing trees, has been dubbed "King of Spades" by other volunteers. His dream is to safeguard Beijing's blue sky, as well as the people's good virtues. "A positive spirit is the most important thing for a man. If everybody can play his part, China will have a bright future," he said. "I hope that I can green the deserts in everybody's hearts, and future generations can live better lives as a result of the efforts of us volunteers."